In the wake of Donald Trump’s election as President of the United States, a grassroots movement emerged to organize a nationwide rally to voice concern for the future of human rights, respect and dignity of women and minorities, and a commitment to democratic norms. Called the Women’s March on Washington, the event evolved specifically in response to Trump’s stated agenda and demonstrated attitude toward these issues, which reflect deeply racist and misogynistic sentiments and policy positions. After a divisive campaign that left many in the nation, and the world, deeply fearful that Trump’s presidency will erode human rights and democratic principles, ordinary citizens and activists united in a groundswell of opposition. On Saturday, January 21, the day after Trump’s inauguration, 1 million people marched on the capitol in Washington DC and were joined by 5 million people across the United States and around the world taking part in concurrent demonstrations in their own communities. This photo collection at the New York Times captures the energy and solidarity of all who participated. Following the event, the Women’s March on Washington launched a campaign called 10 actions for the first 100 days which calls for ongoing collective actions to voice concern and commitment to the policies and programs threatened under the new administration. Every 10 days, participants are requested to take a specific action in support of the campaign goals. The first asks participants to write a post card to their state Senators on an issue that they are particularly concerned about. Visit the campaign page to take part, gain inspiration, and sign up for updates on how you can support the cause. 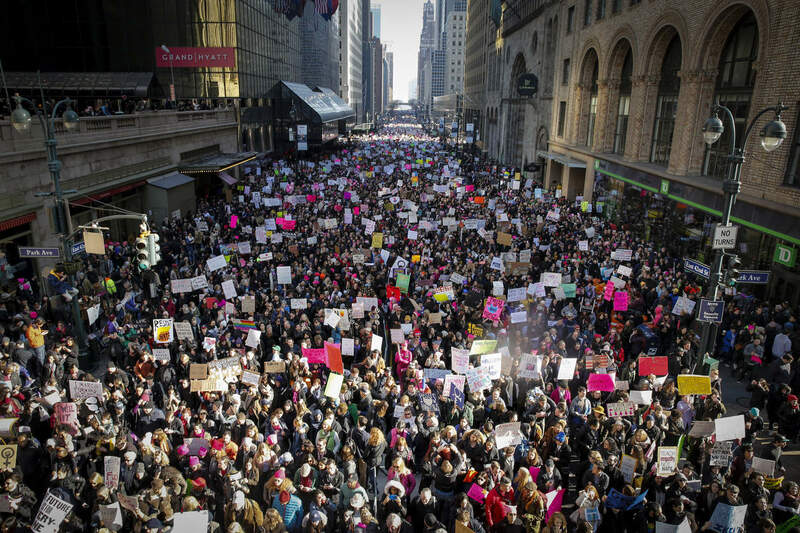 While Donald Trump has been democratically elected – and the Women’s March has been careful to frame its message in support of protecting human rights and not questioning the legitimacy of his presidency – the nature of Donald Trump’s worldview and approach to power calls for vigilance on our part and unwillingness to accept the erosion of public discourse, respect for truth, and the consolidation of power. For it is not only his positions that make Trump frightening; it is his lack of restraint, his impulse to attack, and his governing narcissism. It is his blatant lies aimed at protecting his image, silencing dissent, and alienating the free press. It is his crafting a national narrative that denies verifiable truths and castes himself as an infallible leader, daring opponents to contradict him. These are the marks of an autocrat in the making. For anyone interested in further understanding the dangers presented by this type of leadership, I highly recommend this talk by journalist Masha Gessen. Gessen is originally Russian – now based in New York – and covered the rise of Putin’s power over the last twenty years. She highlights disturbing similarities and blind spots in the public discourse and response to Trump’s election win. It is well worth the watch. Gessen warns of our failure to imagine the dangers that are possible, even in America: we failed to imagine that Trump would secure the Republican nomination, we failed to believe that he was a serious contender, we failed to imagine that a man with his tendencies would be chosen to lead the free world. The New York Times itself could not imagine this and, in fact, had no plan for how it would respond to a Trump victory. Gessen urges us to now remind ourselves of the many examples throughout history in which nationalistic leadership has led to Fascism and dictatorship. While American institutions are historically strong, we must guard against their erosion. We must refuse to normalize leadership that degrades and ignores reality and threatens the rights and principles that we hold dear. Please, engage with the Women’s March and voice your commitment to global human rights and democratic norms. Regressive Two Finger Test Never To Return! Next story Celebrating India- Happy Republic Day! Previous story Happy National Girl Child Day!